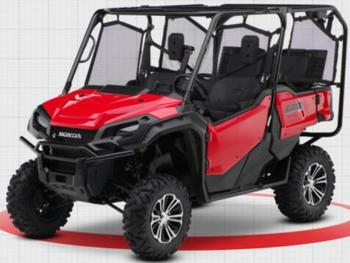 American Honda Motor Company of Torrance, Calif., is recalling about 56,000 recreational off-highway vehicles (ROVs). An incorrectly installed throttle body can ignite, posing fire and burn hazards. The firm has received five reports of throttle body igniting. No injuries have been reported. This recall involves all model year 2016 through 2017, and some model year 2018 Honda Pioneer 1000 side-by-side vehicles. The recalled vehicles were sold in various colors including: red, blue, green, gray and yellow. The name “HONDA” is on the front, sides and the rear of the vehicle. The model name Pioneer 1000 is printed on a label located on both sides of the vehicle, near the rear. The serial number (VIN #) is stamped in the frame at the left rear, below the tilt-up bed/seat. The ROVs, manufactured in the U.S., were sold at authorized Honda Powersports dealers nationwide from August 2015, through August 2018, for between $14,000 and $22,000. Consumers may contact American Honda toll-free at (866) 784-1870 from 8:30 a.m. to 4:30 p.m. (PT) Monday through Friday or online at http://powersports.honda.com/ and click on “Recall Information” at the bottom of the page for more information.